I’m on a bit of a lemongrass kick this week. This super food which is known to be antibacterial, anti-fungal and antimicrobial has proven effective in treating type 2 diabetes, cancer, obesity, stomach disorders, respiratory disorders, insomnia, fevers, rheumatism, infections … shall I go on? It also happens to be tasty and enhances enormously this Thai Red Curry Tofu Stew – deep, soupy, and packed full of flavour. Preheat oven to 400 degrees. Toss cubed tofu with soy sauce. Place on a parchment-lined cookie sheet and bake for 20 minutes until tofu is browned, tossing 1/2 through. When it’s done, set aside. Heat coconut oil in a dutch oven or wok over medium-high heat. Add garlic, ginger and lemongrass, and sauté for 6-8 minutes. Add red curry paste, mix well, and sauté for an additional 3-4 minutes. Add coconut milk, and whisk to combine with other ingredients. Add tofu, red pepper, and onion, and mix well. Bring to a boil, and then reduce to a simmer for 10-15 minutes. While it simmers, add kaffir lime leaves, soy sauce, and brown sugar and continue to simmer until veggies are soft. Serve garnished with basil or cilantro over rice. I think one of my first cookbooks was The Silver Palate by Sheila Lukins and Julee Rosso. It is a fabulous cookbook that became a sort of cooking bible for me when I was just starting to really cook for myself and the family. One of my go-to recipes was Chicken Marabella because it was a simple, easy, impressive dish packed with flavour. It always got rave reviews. I decided to cook it last night for Andrew’s parents’ 87th birthday party, but added a tofu version to serve alongside the meat-lover’s version. Piled on top of mashed potatoes with a good douse of the pan juices, what’s not to like? 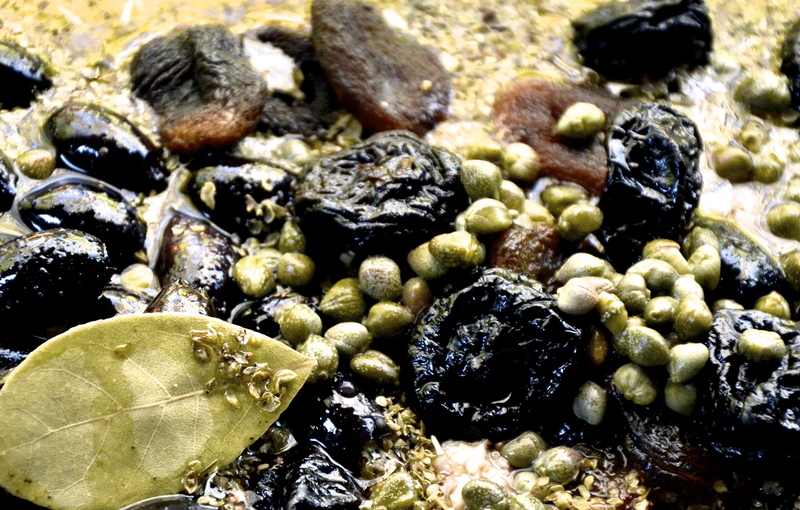 In a large bowl combine garlic, oregano, pepper and coarse salt to taste, vinegar, olive oil, prunes, olives, capers and juice, and bay leaves. 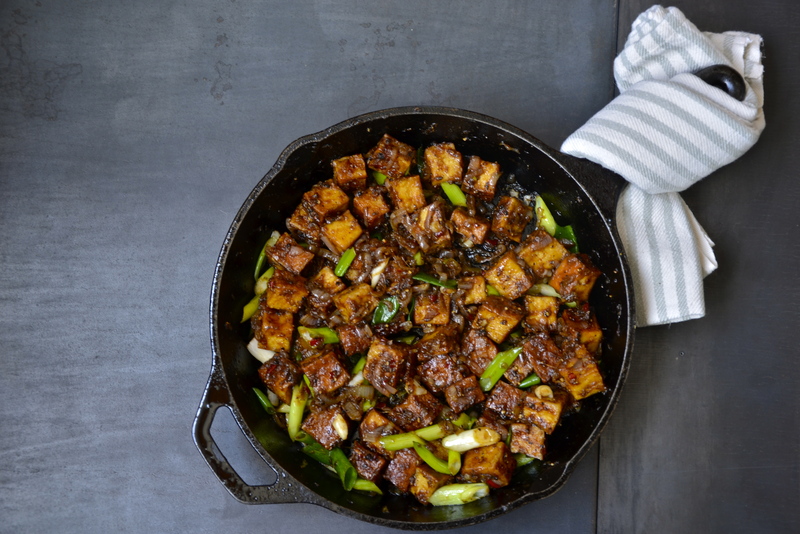 Arrange tofu slabs in a single layer in one or two large, shallow baking pans and spoon marinade over it evenly. Cover and let marinate, refrigerated, overnight. Sprinkle tofu pieces with brown sugar and pour white wine around them. Bake for 45 minutes, basting frequently with pan juices. Carefully transfer tofu, prunes, olives and capers to a serving platter. Moisten with a few spoonfuls of pan juices and sprinkle generously with parsley or cilantro. Pass remaining pan juices in a sauceboat. About 25 years ago Andrew and I ate dinner at my aunt and uncle’s place and my aunt, Marianna, served grilled salmon in a red pepper sauce surrounded by spinach. The memory came back to me the other day; I have no idea why. Odd how the brain works. Maybe a smell? A distant association? Some trigger that jogged the old synapses? Whatever the case, I’m glad it did because, in this revised and veganized version, I’ve found a tasty, beautiful dish that is savoury, sweet, and satisfying. I’m thinking it would be great for a dinner party, not just because it looks so pretty, but because you could easily give people the option of replacing the tofu for other grilled favourites like vegetables, chicken or fish. Of course I’ll take the tofu. Combine ingredients for the marinade in a small bowl and mix thoroughly. Cut firm or extra firm tofu in slabs and place in a single layer in a dish. Add marinade making sure it surrounds the tofu on top, bottom and sides. Set aside or, preferably, refrigerate overnight. Preheat oven to 375 degrees. 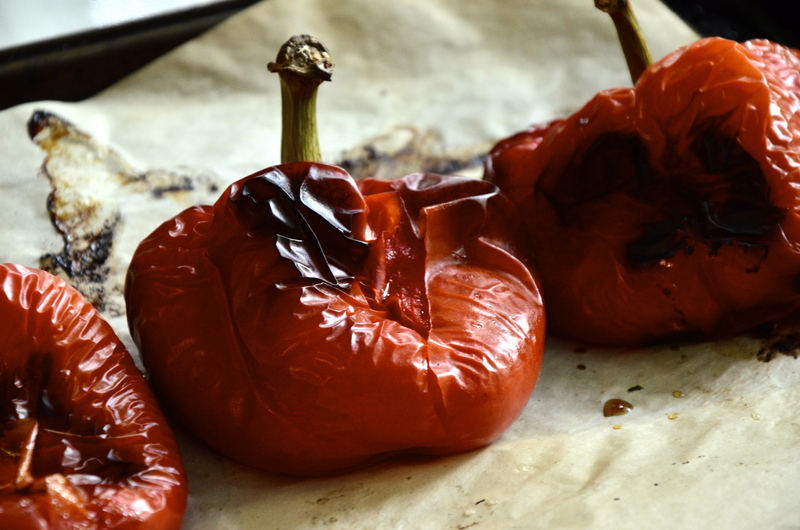 Wash the peppers well and place on a parchment-covered cookie sheet. 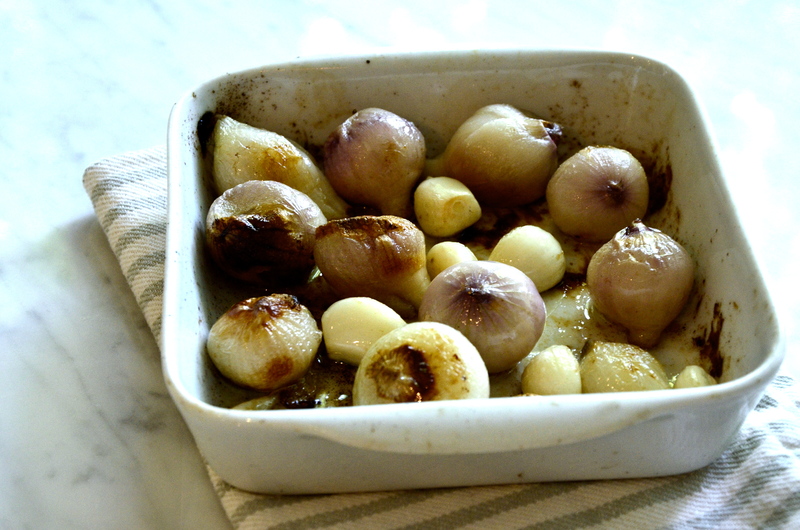 Toss whole shallots and garlic cloves with olive oil and place in a small baking dish. Bake peppers, shallot, and garlic in the oven until roasted and well browned, about 45 minutes. Remove from the oven and place shallots and garlic in a blender. Place red peppers in a paper bag or bowl covered with a tea towel – this makes them sweat and allows the skins to slip off more easily. When cool enough to handle, peel off the skins. Slice the peppers open, pick out and discard all the seeds, then roughly chop the red flesh. Place red pepper flesh in the blender. Add veggie stock, salt and pepper to taste, and then blend until smooth. Clean the spinach well. Place in a steamer and steam over high heat for about 5 minutes until the spinach is wilted but still bright green. Once you are ready to prepare the dish, grill the tofu on a BBQ over high heat. Place the wilted spinach on a plate. Gently place a piece or two of the grilled tofu ontop of the spinach. 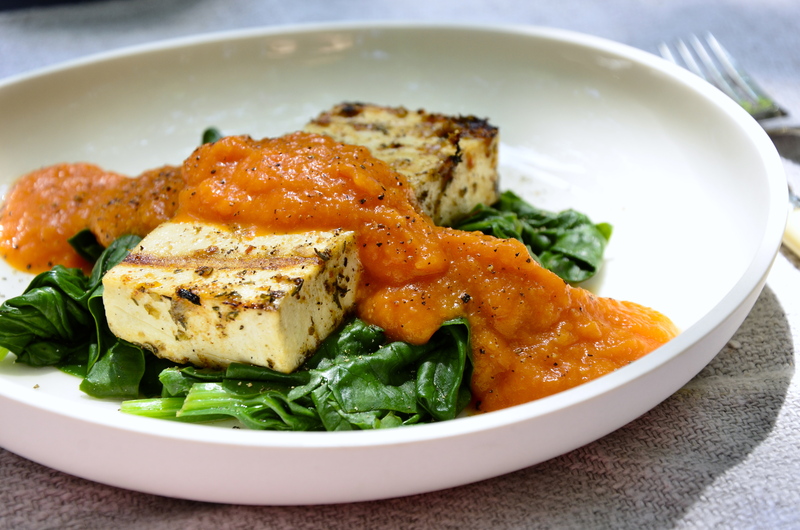 Add a healthy dose of the roasted red pepper sauce over the top. Sprinkle with a little freshly ground pepper. Eat. Enjoy. We were at friend’s for dinner last week and, alongside some awesome vegan dishes, they served Vij’s Lamb Popsicles with Fenugreek Curry Cream. Really tasty sauce. And it got me thinking that it could be easily veganized and served with tempeh. So I tried it and guess what? It worked! Here it’s served in my late-grandmother’s china (God bless her beautiful soul!). I have such fond memories of setting the table with this china in her farm kitchen with the view of her garden out the window and the sounds of birds and cows and children flooding in through her gauzy curtains. We’d sit, say grace, and then load up our plates with chicken, her home-grown potatoes and carrots, and crunchy beans straight from the garden. The reason I’m telling you this is that she would have no clue what tempeh is, or fenugreek, or curry cream. In fact, she would hardly recognize most of the ingredients on the list including turmeric, cayenne or paprika. Even grainy yellow mustard. It occurred to me today as I spooned this tasty, spicy dish into her china bowl, how amazing it is that so much has changed in just two generations – how the world of food has opened up for many of us fortunate enough to live at a time and in places where cultures are colliding and influencing one another. So here’s to Vij’s original Indian recipe. And here’s to the veganized version. And here’s to my grandmother’s china that doesn’t know what hit it! In a bowl, combine the wine, mustard, salt and pepper. Add tempeh, stirring to coat, cover or seal and refrigerate for 2 to 4 hours. In a medium bowl whisk together the soy cream, salt, paprika, cayenne, fenugreek leaves and lemon juice. Heat the oil in a heavy skillet set over medium-high heat and sauté the garlic until golden. Stir in turmeric and cook for 1 minute. Stir in the cream mixture and cook over medium-low heat for about 5 minutes, or until thickened. Preheat your grill or set a heavy cast iron skillet over high heat; remove tempeh from its marinade and grill (or cook in a hot skillet drizzled with oil) for 3-4 minutes until warmed through and browned. 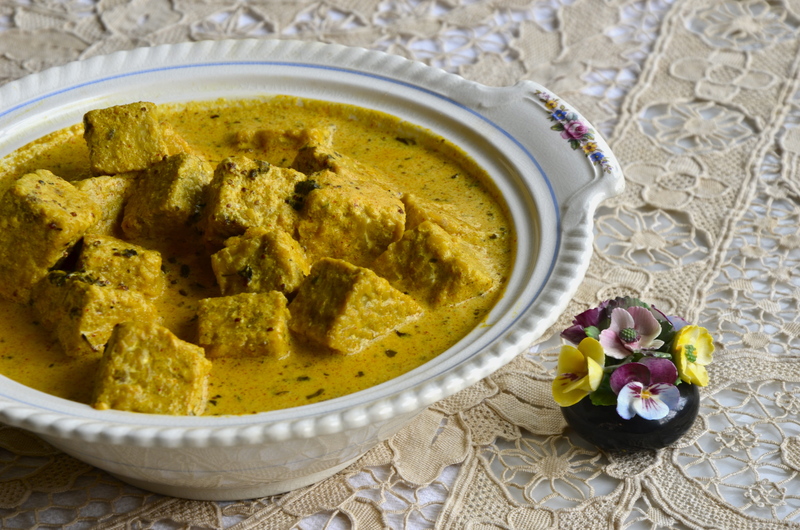 Pour the cream curry over the tempeh or ladle it into a small bowl and use it as a dipping sauce. Serves 4-6. This recipe will give you a serious kick in the pants which is kind of what I need this afternoon after staying up until 2:00 AM with Rebekah and her buddies from camp debating the merits of a local food system with soul at its centre. Long story. 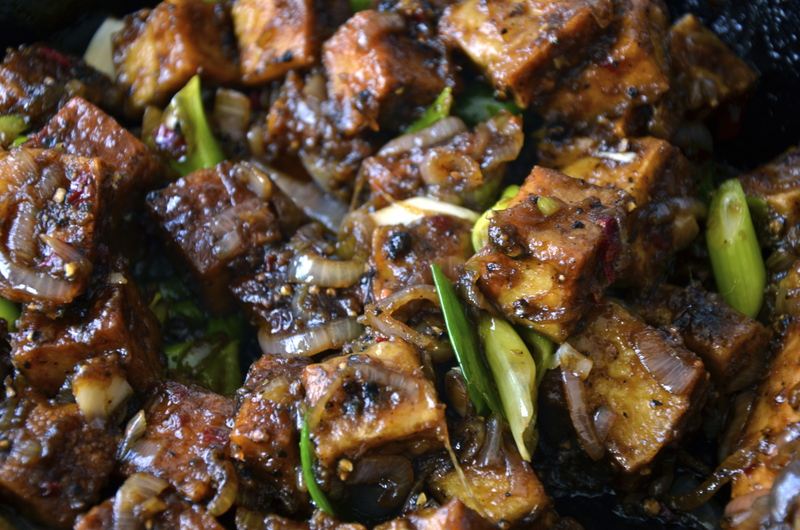 All that’s relevant here, really, is that the neurons aren’t firing at full capacity and this black pepper tofu – with its heavy dose of black pepper, hot chile pepper, garlic, and ginger – is kind of what the doctor ordered to give me a little jolt and help me through the day. I used this fabulous smoked tofu from Salt Spring Island that my friend Anne brings each time she comes to visit. But the dish is just as good – it sings just as spicily, gingerly, and zestily – with good old fashioned plain tofu. It’s adapted from the amazing Ottolenghi and is a great dish with rice and veg like steamed broccoli or lightly sautéed baby bok choi on the side. Start with the tofu. Pour enough oil into a large frying pan or wok to come 1/4 inch up the sides and heat. Cut the tofu into large cubes, about 1 x 1 inch. Toss them in the corn (potato) starch and flour and shake off the excess, then add to the hot oil. 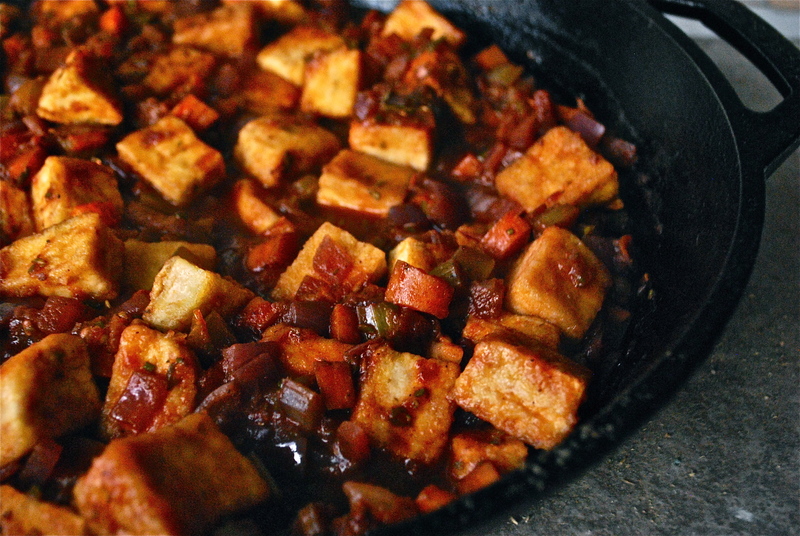 (You’ll need to fry the tofu pieces in a few batches so they don’t stew in the pan.) Fry, turning them around as you go, until they are golden all over and have a thin crust. As they are cooked, transfer them onto paper towels. Remove the oil and any sediment from the pan, then add some clean oil to the pan. Add the shallots, chiles, garlic and ginger. Sauté on low to medium heat for about 15 minutes, stirring occasionally, until the ingredients have turned shiny and are totally soft. Next, add the tamari and sugar and stir, then add the crushed black pepper. Add the tofu to warm it up in the sauce for about a minute. Finally, stir in the green onions. Serve hot, with steamed rice. Nobu Matsuhisa is a superstar Japanese chef. He just came out with Nobu’s Vegetarian Cookbook which is really Nobu’s Vegan Cookbook since he doesn’t tend to use any dairy. I found this recipe for deep-fried tofu and brown rice salsa to which I added deep-fried asparagus because it’s yummy and easy and asparagus is still in season … soon to end. So sad. After deep-frying the tofu, I just threw the asparagus in the same oil for a minute, max. Once asparagus is out of season I probably won’t use it but one could easily substitute it with any other tasty plant matter for added colour, texture, and taste. 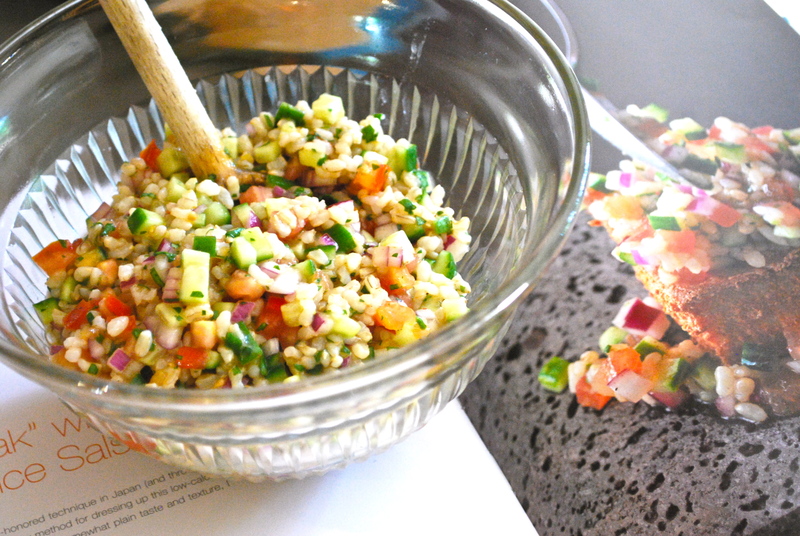 Not only is this delicious and healthy but showy too, so it would be perfect for a simple summer backyard dinner party. To prepare the tofu, wrap it in a few layers of paper towel, place it on a cookie sheet, and then weight it down with a heavy pot. Let sit, allowing it to drain for about an hour. Meanwhile, mix together rice, red onion, cucumber, and tomato. Add cilantro and jalapeño. Mix the ingredients for the dressing together – soy sauce, lemon juice, salt, pepper and olive oil. Toss with the rice salsa and mix well. Set aside. Once the tofu has drained, cut it in thick slices and dredge in the flour. Heat the oil in a heavy bottom skillet until it’s very hot. Add the dredged tofu and fry until it turns a golden brown colour. Flip and do the same on the other side. Once the tofu is crispy and brown, place it on some paper towel. If you are using the asaragus, toss it in the hot oil for a minute maximum until it sizzles but stays a nice bright green. 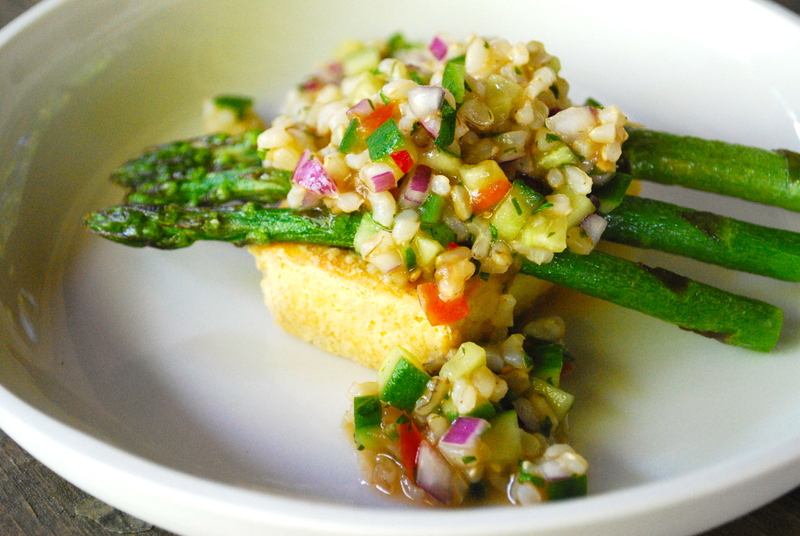 To serve, place the asparagus on top of the tofu, and then add a generous serving of the brown rice salsa. As many of you will know, osso buco is a Milanese specialty of cross-cut veal shanks braised with vegetables, white wine and broth. With the recent reporting out of Harvard on red meat consumption and how unhealthy it is, I was thinking a little nosso buco might nosso be a bad idea. “If you really want to go for the lowest possible (risk), it does look like not consuming red meat at all, or a couple times a year, is where you’d want to be” says Dr. Willet, a red meat lover himself. This recipe has all the benefits of osso buco but without the bad stuff. Simply substitute the veal for some crisped-up tofu and you’ve got a recipe that even the Milanese would have to agree rocks. Start with the tofu. Heat 1/4 cup of the olive oil in a heavy bottom skillet. Toss the cubed tofu in the cornstarch until well-coated. and shake off the excess. Add them to the hot oil in batches so they aren’t too crowded. Fry, turning them as you go, until they are golden all over and have a thin crust. After they are cooked, transfer them onto paper towels. Set aside. Meanwhile, heat the other 1/4 cup of the olive oil in a heavy bottom skillet. Add the onions, carrots, and celery and sauté until they are cooked and tender. Add the minced garlic and sauté for another minute or two until fragrant. Add the white wine and let bubble away until it’s reduced by half. Add the stock, tomatoes, bay leaf, and thyme. Bring to a boil and then turn the heat to low and simmer for about 20 minutes until the sauce is slightly thickened. Add sea salt and pepper to taste. When the sauce is just right and the tofu is done, add the tofu to the sauce and stir gently and minimally until the tofu is just incorporated. Serve with garlic smashed potatoes, and, for a really authentic nosso buco, with a gremolata of lemon rind, garlic, and parsley on top.